The first book-length account of the closest thing to a coup that the United States has ever experienced. In late 1782, many Revolutionary War officers in the Hudson Highlands had grown angry and frustrated that they had not been paid—for months or even years. With victory in sight, they feared they might never get their back pay and promised pensions, because the Continental Congress, meeting in Philadelphia under the Articles of Confederation, had no authority to raise money. Nationalists wanted Congress to have direct taxation authority, while their opponents insisted that only individual states should have that power. As the last months of the war approached, several key army officers, supported by some members of Congress, set in motion a plot to terrify state legislators and their delegates in Philadelphia into granting Congress the direct taxation authority it needed to pay the promised wages and guarantee future pensions. Their threat presented Congress with two alternatives. In March, 1783, hundreds of Washington’s officers, “ready for revolt,” gathered at the newly-built Temple of Virtue at the New Windsor Cantonment to agree on the first steps toward implementing their plan. Then, to their shock, General Washington himself arrived, and in a 15-minute address changed the course of history. Connecticut native Dave Richards served seven years in the U. S. Army, primarily in military intelligence. While serving in that field, he received more than two years of Russian language instruction and specialized training for an assignment in West Berlin as a transcriber of Soviet military communications. 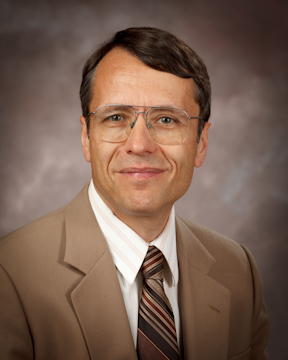 Following his service commitment, he attended George Washington University and Ohio State and earned a BA in Russian language and literature and an MA in Slavic and East European languages and literatures, respectively. Upon completing his studies he joined the faculty of the Defense Language Institute in Monterey, California, where he taught Russian to members of the armed forces. When the Cold War came to an end he earned certification to teach English as a Foreign Language to adults and taught in Korea and Japan for twelve years. An avid student of American history, Dave writes regularly for The Historical News, a series of historical quarterlies published by the Southern Historical News that are distributed throughout the South. He is active with Four Seasons Toastmasters in Hendersonville, NC, where he lives, and is a frequent speaker on a range of historical subjects. His interest in history led him into extensive research on the Newburgh Conspiracy and the key figures involved. Dave is a member of the Writers’ Guild of Western North Carolina. He is now researching a book about the court martial of Jackie Robinson..
A superbly detailed and documented history of an obscure chapter of American history, Swords in Their Hands: George Washington and the Newburgh Conspiracy is a simply fascinating study and strongly recommended reading for anyone with an interest in the emergence of the United States as a political entity in general, and the contributions of George Washington to American governance in particular. A seminal work of impressive scope, Swords in Their Hands: George Washington and the Newburgh Conspiracy is very highly recommended. Local historian and author Dave Richards is an avid student of American history. He is a regular contributor for The Historical News and is a frequent speaker on a range of historical subjects. 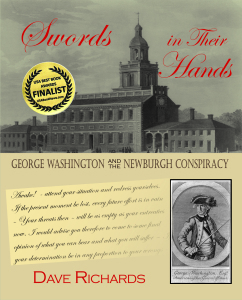 His book Swords in Their Hands: George Washington and the Newburgh Conspiracy is a meticulously researched study of a little-known but important event in American history. This nonfiction book will be essential reading … The story pulls you along and tells a little-known tale of historic significance for our country. Few Americans realize that in March 1783 General Washington had to stare down an uprising by disgruntled army officers known as the Newburgh Conspiracy. In this comprehensive study of the conspiracy, Dave Richards tells the dramatic story of Washington’s role in quashing a military rebellion against the Congress. Well-researched, clearly written, and carefully argued, Swords in Their Hands tells a gripping story that makes an important contribution to the history of the Revolutionary War. One of the least known but most important events in the founding of the United States, the Newburgh Conspiracy involved many of the most famous leaders of the age. Its collapse marked a turning point in American military history, the consequences of which affect us still today. We are indebted to Dave Richards; his book should be widely read. Swords in Their Hands tells the detailed story of the new United States of America on the brink of a military coup during the American Revolution. It is a must read for anyone who wants to know the full story of the crisis.